There are several chess-inspired good Samaritans out there and it's always quite gratifying to feature these stories. Here are two more such chess lovers - in different parts of the world - doing their bit to make the world a better place. A chess event organised by Carl Portman from Banbury Chess Club will take place at 2 pm on Sunday in Hanwell Village Hall. Grandmaster Daniel King will be playing up to 20 players at once. 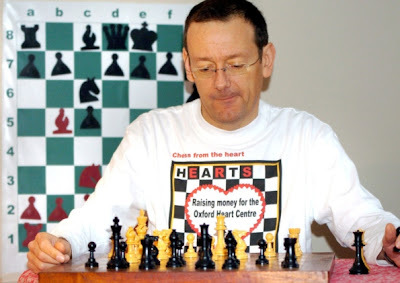 Carl Portman is organising the event to raise funds for the Oxford Heart Centre. What would you do if you won $1,000? Would you go on a shopping spree, plan a vacation? How about give it away? That’s what 16-year-old Kevin Chung did. The junior from Reed High School in Sparks recently took first place in the D/under section at the local Larry Evans Memorial chess tournament in March. 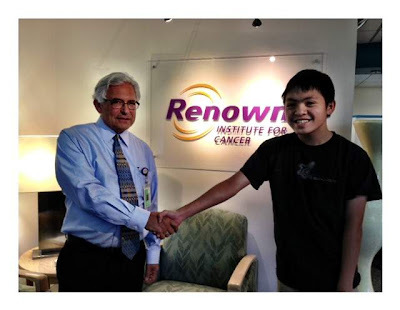 He then donated his prize money to the Renown Institute for Cancer and was on-site on Tuesday to present the funds in person. Chung started out playing chess with friends but quickly moved on to more professional play as he gained experience. He enjoys the challenging and competitive aspects of chess and has plans to play in upcoming tournaments. The teen said he enjoyed the rewarding feeling that came from making a difference in someone’s life and felt good about his contribution. Chung said he will not stop with this display of generosity. He hopes to continue to contribute any winnings he might receive in the future to those who are in need of help. “I don’t need the money, so why not give it to a good cause?” he said.